Just because the curtains have closed on another amazing summer, doesn’t mean the island goes to sleep, there are still some unmissable events taking place. Even throughout the winter Ibiza plays host to some phenomenal parties, so we thought we would share a few that might make you consider delaying your flight home or taking a short trip across the pond. You haven’t experienced Halloween until you experience Halloween at Pikes. This quirky hotel where no two rooms are the same, make for the perfect spooky location as it’s transformed into a haunted house. If you like to go all out this time of year you will fit in perfectly, party goers do not hold back when it comes to their costumes, dressing up as anything from the Black Swan to the Ice Queen. You can either purchase a ticket or make a break of it as they offer 2 night stay packages including drinks and food, of course this package is not for the faint hearted as your 2 night stay will be far from relaxing! 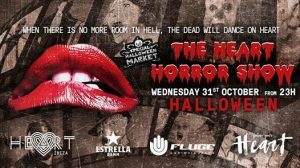 Another amazing halloween choice comes from one of the most innovative restaurant/club venues on the island. Heart are known for their immersive theatre in which they engage the audience using food, art and music, so it comes as no surprise that their halloween party will not disappoint. If you like the idea of not knowing what is coming next, then this party is for you, but be warned it is at your own peril! This psychedelic street party takes place in San Antonio in January. The streets are decorated with love hearts and peace signs as live music and dancing flows through the West End all the way to the fountain. 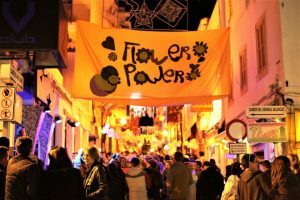 This event is the perfect way to brighten up your winter as some people opt for full Flower Power attire, so feel free to dig out your flares and sequins for the day. This fabulous street party, attracts a great crowd, all looking to have fun and dance to some of their favourite tracks from the past. Yes you heard us right DC10 New Years Day! If you thought this party paradise just shut up shop after the closings, then you are in for a treat. 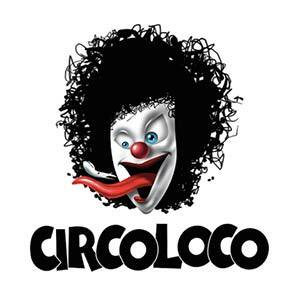 DC10 opens their doors again on NYD for Circo Loco. This huge party will not disappoint if last year’s amazing line up is anything to go by expect the likes of Seth Troxler, Richy Ahmed, Art Department, Apollonia and more! Doors open at 16:00 until 5am giving you hours of New Years celebrations to enjoy. 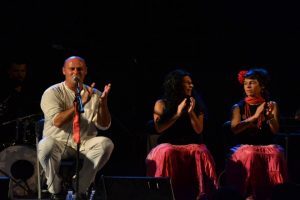 Although Flamenco is not the first thing that comes to mind when you think of Ibiza, 2017 saw the introduction of the first Flamenco festival based in San Antonio. The first year was a great success and this continued through 2018 in which Mayte Martin (very famous within the Flamenco world) headlined the event with her spectacular voice. You do not need to be a Flamenco fanatic to enjoy this festival, the atmosphere alone is enough for anyone to appreciate it.